(b)1. Any person who is convicted of a third violation of this section for an offense that occurs within 10 years after a prior conviction for a violation of this section commits a felony of the third degree, punishable as provided in s. 775.082, s. 775.083, or s. 775.084. 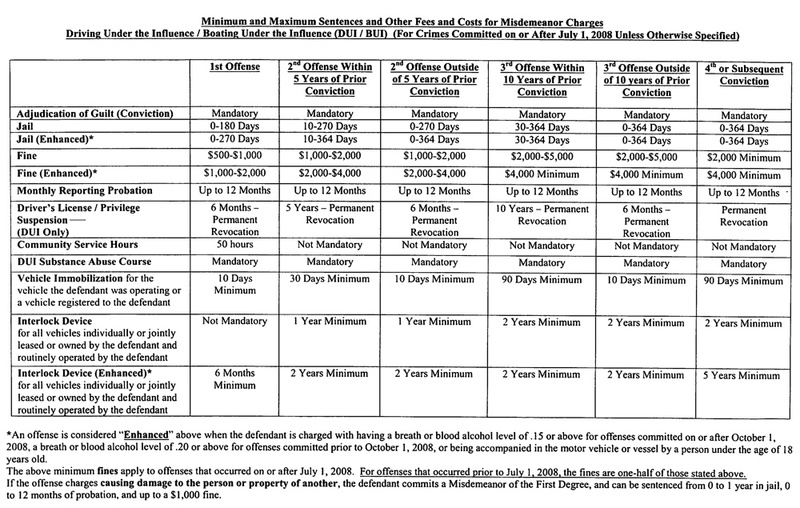 In addition, the court shall order the mandatory placement for a period of not less than 2 years, at the convicted person’s sole expense, of an ignition interlock device approved by the department in accordance with s.316.1938 upon all vehicles that are individually or jointly leased or owned and routinely operated by the convicted person, when the convicted person qualifies for a permanent or restricted license. The installation of such device may not occur before July 1, 2003.
a. A felony of the second degree, punishable as provided in s. 775.082, s. 775.083, or s.775.084. For purposes of this subsection, the term “unborn child” has the same meaning as provided in s.775.021(5). A person who is convicted of DUI manslaughter shall be sentenced to a mandatory minimum term of imprisonment of 4 years. (5) The court shall place all offenders convicted of violating this section on monthly reporting probation and shall require completion of a substance abuse course conducted by a DUI program licensed by the department under s. 322.292, which must include a psychosocial evaluation of the offender. If the DUI program refers the offender to an authorized substance abuse treatment provider for substance abuse treatment, in addition to any sentence or fine imposed under this section, completion of all such education, evaluation, and treatment is a condition of reporting probation. The offender shall assume reasonable costs for such education, evaluation, and treatment. The referral to treatment resulting from a psychosocial evaluation shall not be waived without a supporting independent psychosocial evaluation conducted by an authorized substance abuse treatment provider appointed by the court, which shall have access to the DUI program’s psychosocial evaluation before the independent psychosocial evaluation is conducted. The court shall review the results and recommendations of both evaluations before determining the request for waiver. The offender shall bear the full cost of this procedure. The term “substance abuse” means the abuse of alcohol or any substance named or described in Schedules I through V of s.893.03. If an offender referred to treatment under this subsection fails to report for or complete such treatment or fails to complete the DUI program substance abuse education course and evaluation, the DUI program shall notify the court and the department of the failure. Upon receipt of the notice, the department shall cancel the offender’s driving privilege, notwithstanding the terms of the court order or any suspension or revocation of the driving privilege. The department may temporarily reinstate the driving privilege on a restricted basis upon verification from the DUI program that the offender is currently participating in treatment and the DUI education course and evaluation requirement has been completed. If the DUI program notifies the department of the second failure to complete treatment, the department shall reinstate the driving privilege only after notice of completion of treatment from the DUI program. The organization that conducts the substance abuse education and evaluation may not provide required substance abuse treatment unless a waiver has been granted to that organization by the department. A waiver may be granted only if the department determines, in accordance with its rules, that the service provider that conducts the substance abuse education and evaluation is the most appropriate service provider and is licensed under chapter 397 or is exempt from such licensure. A statistical referral report shall be submitted quarterly to the department by each organization authorized to provide services under this section. (10) The rulings of the Department of Highway Safety and Motor Vehicles under s. 322.2615shall not be considered in any trial for a violation of this section. Testimony or evidence from the administrative proceedings or any written statement submitted by a person in his or her request for administrative review is inadmissible into evidence or for any other purpose in any criminal proceeding, unless timely disclosed in criminal discovery pursuant to Rule 3.220, Florida Rules of Criminal Procedure. b. Not be a chronic and habitual user of alcoholic beverages to the extent that his or her normal faculties are impaired; not have been committed under chapter 397, former chapter 396, or a similar law in any other state; not have been found to be a habitual offender under s.856.011(3), or a similar law in any other state; or not have had any convictions under this section, or a similar law in any other state, within 2 years before the affidavit is submitted.